[2009-07-27] The social game “Page Hunt” developed by Hao Ma at Microsoft showed up on MIT Technology Review [Related News]. [2009-01] Congratulations to Dr. Kaizhu Huang for winning the Book Award in the Second Annual “Three One Hundred” Book Conference [Related News]. Mr. Qirun Zhang's paper “Fast Algorithms for Dyck-CFL-Reachability with Applications to Alias Analysis” was accepted in PLDI'13 (Programming Language Design and Implementation). Haiqin Yang was awarded CUHK Global Scholarship Programme for Research Excellence (CNOOC) for 2008-9. He is spending six months at Stanford University and UC Berkeley, USA. 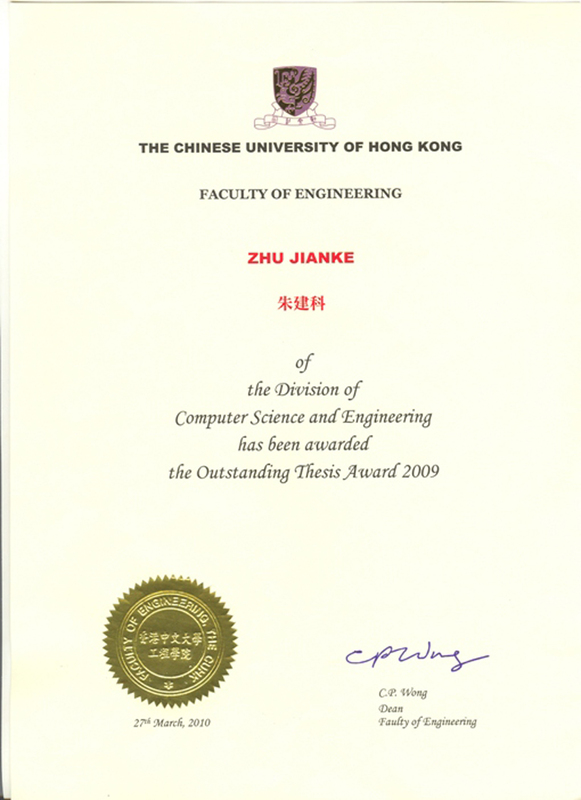 Zenglin Xu was awarded Faculty Postdoc Fellowship, Engineering Faculty, CUHK. Zenglin Xu was awarded Travel Grant to attend IJCAI2009, Pasadena, USA by IJCAI. Hongbo Deng was awarded Student Travel Grant to attend KDD2009, Paris, France by KDD. Hongbo Deng was awarded Student Travel Grant to attend SIGIR2009, Boston, USA by SIGIR. Hao Ma was awarded Student Travel Grant to attend SIGIR2009, Boston, USA by SIGIR. Wujie Zheng was awarded Student Travel Grant to attend ICSE2009, Vancouver, Canada by ICSE. Zibin Zheng was awarded Student Travel Grant to attend DSN2008, Anchorage, Alaska, USA by DSN. Wujie Zheng visited the North Carolina State University, USA, 2009.04-2009.05.